As you may have discerned, I love 17th-century names. Even when I am supposed to be doing other work, I often find myself thumbing through indices and vital records, looking at names. Last semester, I was working on a project about the Dorchester Removal, a 1636 incident in which most of the town of Dorchester, MA picked up stakes and moved to the Connecticut River Valley. As part of my research, I converted the Connecticut Historical Society's 1930 publication of the Windsor church records into a handy little database. This allowed me to discover many interesting tidbits, such as average age of marriage, family size, instances of bridal pregnancy, etc. 1. The top five names were very popular. Today, many parents attempt to avoid choosing common names for their children, hoping that their baby won't go through school as "Joshua S." or "Emily D." In the 17th century, parents weren't so worried about that. 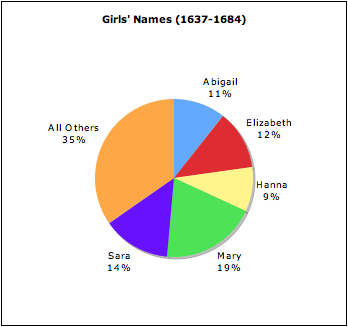 Among the 478 girls born in Windsor (1637-1684), 65% shared the top five female names. About 51% of the 533 boys of the same generation shared their top five. Among the older generation, the breakdown between top five and other names is exactly the same as for their children. 2. 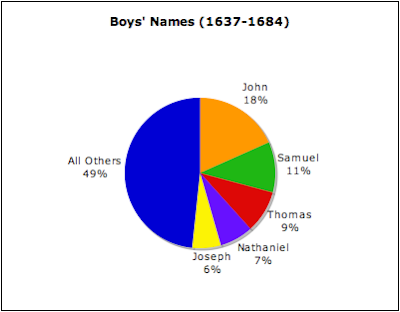 Old Testament names are more common among the younger generation. 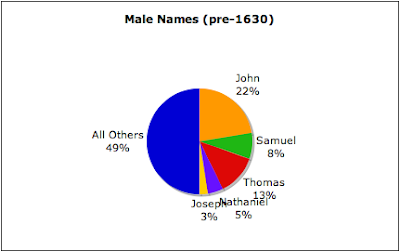 You'll notice that among the top five names for both males and females, Old Testament names (Sarah, hannah, Abigail, Joseph, Nathaniel, Samuel) are slightly more common among the younger generation. 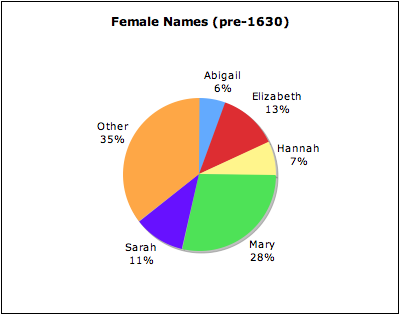 Among babies born in Windsor who did not have top five names, 53% of girls and 68% of boys bore Old Testament names. Their parents were much less likely to have Old Testament names (35% of women and 29% of men, excluding those with top five names). To me, this suggests that members of the older generation were born to more secular families, turned to stricter religion later, and named their own children in honor of their new faith. 3. Some families liked to name their children after particular Bible stories. Sometimes, children were named in honor of groups of characters in the Bible. The best example of this is the case of the Cook children: Moses (b. 1645), Aaron (b. 1640), and Miriam (b. 1642). Of the 1,011 children born between 1637 and 1684, only three are named Abraham and each of them has a brother named Isaac. I think that this is evidence that the Windsor settlers thought of themselves as Biblical actors recreating the history of the Old Testament. 4. Some names have me stumped. Most of the Windsor names come from the Bible. Others are secular English names (Jane, Alice, Henry). Some are a mystery to me. If anybody knows the origins of the names Benaga (male), Bethiah (female), or Asubath (female), please let me know. My own study of 17th and 18th century Cambridge has introduced me to the man's name "Jeduthan." This was common in Menotomy, the northwest precinct of Cambridge. It is often abbreviated as "Jed'n." If anyone knows where this came from, I'd love to hear it! Jeduthanor Jeduthun was a Levite musician who attended King David. In the King James Bible, his name appears in both first and second Chronicles. "The holy singers also, the sons of Asaph, were in their order, according to the appointment of David, to wit, Asaph, Zacharias, and Jeduthun, who was of the king's retinue." One good thing about the internet is that there are a lot of Christian organizations that want to do all they can to make the Bible easily available. When I was looking up the Windsor names, I used a couple of sites that proved helpful. The first was christiananswers.net, which provides long lists of male and female Bible names. The other was a UMichigan site that has the . I live in Cambridge and spend a lot of time in old graveyards - if I come across a Jeduthan, I'll be sure to take a picture and post it! Well, the end of that comment is pretty badly messed up. Let's try this again. I meant to say that the site at UMichigan has a searchable version of the KJV, which is useful for finding what colonial New Englanders might have found in the Bible. Clicking on the link-gone-wrong at the bottom of my previous comment should get you to the searchable KJV. Thanks, Mark! I'm glad you enjoy the blog. I was always interested in the Civil War as a kid, but after I got to college, I started sliding back in time until landing in the 17th century in grad school. I'm just now rediscovering my interest in the Civil War. Please feel free to make comments - I'm new to this literature and always welcome reading suggestions.